Colonial Williamsburg – Let's Go RVing! Since we had such a long day yesterday we took it a little easy and didn’t even arrive at Colonial Williamsburg until 11:00. As we were walking up we saw Phillip and Becky, our NC Directors and joined them for a delightful day. Recommendation was to take the shuttle bus for the entire ride which encircled the historic district so we decided to do that realizing that we’d get enough walking in as the day progressed. After going all around we all decided that we hadn’t gotten a lot out of that – don’t recommend it to anyone else. We got off at the Governor’s Palace which we had seen before but it was interesting to see it again. The palace was noticeably clean. All the chandeliers were sparkling and I didn’t see one bit of tarnish on the silver displayed. When do they do all of that cleaning? I think I need to take them home! After the palace we wandered around a bit and then decided on lunch at Chownings Tavern where we had eaten when we were last here. The menu was interesting, written I suppose in Olde English. of the entrée’s was accompanied with sippers. None of had any idea what that was – it was toast! Each of us got something different. I just got a garden wedge salet and a Basket of House-Made Chips—rustic hand-cut seasoned potato chips served with a trio of Chowning’s dipping sauces: malt vinegar bleu cheese, rarebit sauce, and gunpowder sauce. The gunpowder sauce was a little hot but very good. Jerry got Bangers and Mash—Roasted English sausage with sautéed onions and mushrooms, served with Madeira brown sauce on a bed of whipped colcannon potatoes. I had to look on the menu to determine what bangers were. 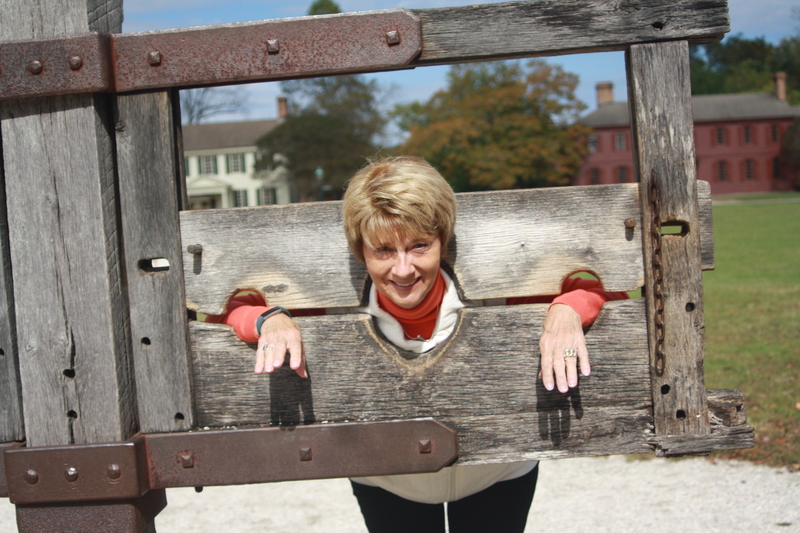 Jerry couldn’t resist a picture of me in the stocks. After lunch we walked around a bit and then Phillip and Becky decided to return to the campground. Jerry and I walked around a bit more enjoying a beautiful afternoon. One of the shops we went into was a silversmith. I learned that when silver is engraved some of the silver is lost but if it is etched on the back, a process called repoussee then all of the silver is retained and it keeps its weight. In Colonial times the worth of silver was determined by its weight so silver designed by the repoussee method was more valuable. By this time we were getting a bit tired so we headed back to the Visitor’s Center by shuttle. They have two gift stores so we went in both and I bought the ubiquitous magnet for Williamsburg. I had bought one yesterday for Jamestown thinking I might have already gotten one and I had so now I have two Jamestown magnets on an already crowded fridge! Tomorrow we visit Yorktown and I’ve already checked. We have the magnet! We had to get to the Newmar tent a bit early because they wanted a picture of the North Carolina Tarheels – do you know how hard that is for us as NC State fans to say we belong to the North Carolina Tarheels? Our boys would love that! Oh well, we got the picture. The night began with a salute to the Virginia State Directors who were retiring and then they had a raffle. Next we all played Card Bingo. It’s a real easy game with a lot of winners but alas not us. It was fun though. Lucky for us Becky and Phillip who by the way are our next door neighbors drove to the tent so we got to ride up and back with them and didn’t have to brave the cold, dark walk back.